Sometimes on a Friday morning I take myself off to Basildon to have a look around the charity shops (sadly, not as good as they used to be), perhaps buy myself something tasty for lunch in M&S, and visit the town centre church's 'Bargain Box' rummage sale. The 'Bargain Box' is held every Friday morning and I've found some quite nice bits and pieces there over the past few months. Everything is very nicely laid out and neat and tidy, which is probably why I hadn't noticed the large box of linens until today. The only reason I was drawn to them then was that somebody else was going through them with amazing vigour and I thought I might as well join in to see if between us we could actually get to the bottom of the HUGE cardboard box. There were tons and tons of net curtains and bedding of the not-so-vintage variety but there were also some rather nice vintage pillowcases. 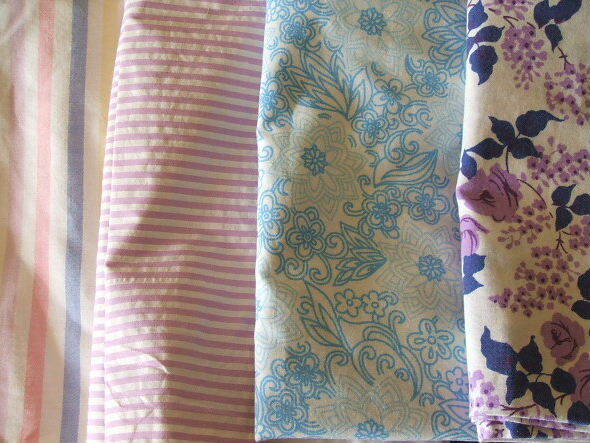 One candy stripe, two white and lavender stripe (sadly having been got at around the top with a pair of pinking shears and some rather dubious hand-stitching otherwise I would have used these as they are) one blue and white floral, and, my favourite, one with purple roses. All destined to become book bags at some point. 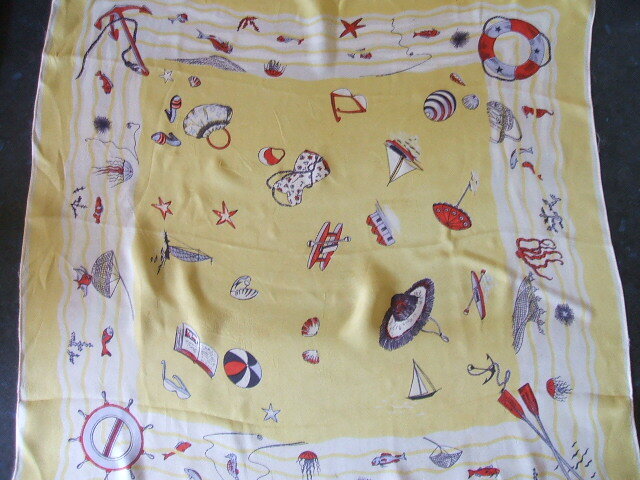 I also got this small silk scarf with a fantastic beach / marine theme on it. And the grand total for six pillowcases and one silk scarf - £1. Excellent!! Now I don't feel quite so deprived that I won't be able to go to the car boot sale this weekend when it looks like rain will stop play - yet again! !